"a different kind of movie. It's not violent. Nobody gets laid." "I found somebody who, when we were writing together, there is a real dynamic energy aroused," Jill says of Bruce. "We are kindred and I owe him so much for walking into my life." In 1989,Prince was preparing Jill's second album.One of the songs he submitted to her was "Boom Boom" and a video was filmed. No wonder why Prince kept her around! Trying to be a little silly, but when I saw her in GB, I was amazed. She is hot and has talent. Jill didn't like the "Boom Boom" song.She said it is an older song (from 1982?) that Prince reworked for her,but she still wasn't happy with it.Her planned second album on Paisley Park was never released. I am surprised she did a video for this since she said she hated the song. Also notice another associate who had a bad time with Steve. I am surprised she did a video for this since she said she hated the song. Prince probably insisted that she do a video,just to see if it will work or not.....and to convince her that the song could be a hit. It is a really good song and not as sexual as she made it out to be. Tame for the times. Boom, Boom (Can't U Feel The Beat Of My Heart) is an unreleased song recorded in Summer 1982 at Prince's Kiowa Trail Home Studio, Chanhassen, MN, USA (along with several other tracks that would re-appear over the next several years). In Summer 1989, Prince revamped the track at Paisley Park Studios, Chanhassen, MN, USA, for use on the proposed second album by Jill Jones (along with My Baby Knows, from the same sessions, and Flesh And Blood and Am I Without U?). A video clip was produced for the song, indicating that it may have been intended as the first single from the album, but the album was not completed, as Prince and Jill Jones disagreed on the direction of the album, with Jill Jones wanting to sing more mature songs than Prince was providing. I've said this before: Jill's debut album should have been prepared and released much earlier.In 83/84,Prince had no shortage of songs for her ("Boom Boom" was originally recorded in 1982) and she would have been able to benefit from Prince's massive popularity back then.Late 1984 or early '85 is when her album should have came out. Yep, we've both been saying the same thing for a long time. Was bumping Boom Boom n Jill's Flesh cuz o this thread earlier . Also, luv that pic n the vid. She was fine! Jill was always my fav, vocally and visually, of his associated artists. What a babe. I also found out today she is half black, never knew that! I also found out today she is half black, never know that! Totally missed out, UCM could have faired better maybe if protégés were included more. 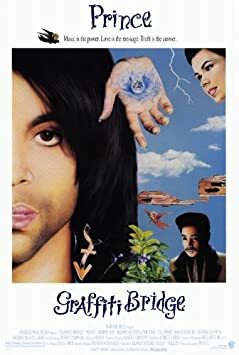 In the interview Jill Jones did on Aug20 for the Prince Podcast, she goes into great detail on graffiti bridge, some real interesting stuff. Inteview is over 2 hours long and very very informative. When you think about it,Jill got a raw deal in both movies (PR and GB).Neither movie featured a song by her and her character was unimportant.In GB,she had to lip-sync someone else's vocals ("Love Machine"). I could have sworn that,months before UTCM came out,I heard that Mazarati was gonna appear in it....probably be in a club scene?